I am sure this happened to everyone that ever went into the back country armed with a map and a compass. No matter how careful you are, you eventually come to situation in which where you think you are and where you really are are two different things. That’s right, you’re lost. Topo maps are great tools but the reality is that a couple of contour lines on a map do not often translate well into what the terrain actually looks like. And whoa be it that you have only a flowery trail description in a trail guide that is long on describing the wonders of nature while giving very ambiguous directions. The problem really lies with the fact that you really need two bits of information when navigating the backcountry. You need to know the terrain which is what a map tells you. AND you need to know where you are on that map. A great step forward came with the invention of the GPS system that now orbits above us. Rather expensive little devices came along that could connect the bits and give you a map and your position on it. Besides being expensive however, the maps where still pretty abstract and it was often times pretty difficult interpreting the terrain. What you really needed was a device that wasn’t too expensive and was easy to operate that gave you a high resolution satellite map of the area you were in as well as your exact location. Well that device is here folks and most of you that are reading this already have one. It is today’s smartphone. Besides being a phone, this little device is a small computer, a high resolution visualization device and a GPS locator. Today the software apps are out there that let you combine all three of these capabilities to give you a device that will let you navigate the back country and hopefully never get lost again. While there are many ways to get this functionality, this article will describe a method that is easily accessible to everyone with a smartphone and FREE. First of all you need a modern smartphone, either an Apple iOS or Android one will do. You will also need to install the Google Earth mobile app (from iTunes or Google Play store). When you start up the app you can choose to have it show your current location from the menu and it will show it on the map as a little blue ball as shone in Figure 1. That is all well a good, but that won’t really help you get from one place to another in the back country. The final piece is getting the navigation information like landmarks and trail routes into the device so that you can follow them to your destination. Figure 1 – Mobile Google Earth app with KML file information displayed. Enter the KML file. There are some standard formats that have been created that allow navigational information to be recorded into a computer file. The KML file is the standard that is used by Google Earth. A file can be created that shows the route of a hike, the landmarks and the destinations. These files are commonly available on the internet for many different locations. The trick is getting the file onto your smartphone so you can use it. There are a number of ways to get a file onto your smartphone. The easiest is downloading it if a download is available. Another way is to have the file emailed as an attachment which can then be extracted to the phone. Files can also be transferred from a personal computer directly to the phone via a USB cable or by wireless or bluetooth. For iOS phones the AirDrop app works well for transferring files wirelessly. For Android phones there are many apps available in the play store. Whatever method you decide on, once you get the KML file transferred to your phone, you only need to tap on the file and it should open up the Google Earth app with the information from that file displayed. 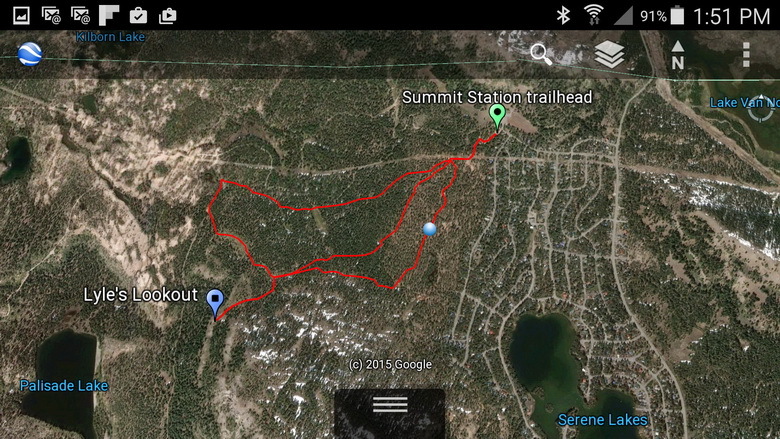 Figure 1 shows you an example of a KML file for a hike to Lyle’s Lookout opened up in Google earth. The hiking trails are shown in red and the landmarks are labeled. And most important, your location is shown as the blue ball. You have all the information to arrive and your location and a locator that tells you exactly where you are at all times. Some of you are probably thinking , hey wait a minute, I won’t be able to get reception when I’m out in the back country so what good is my smartphone going to be. Here is the beauty of the Google Earth software. When you look at an area in Google Earth in the app, the map information is stored in the cache of the smartphone. Most smartphones have a pretty big cache and store a lot of data. You can also go into the settings of the Google earth program and set the cache size to large which is recommended. Using your smartphone without connectivity takes only a small about of preparation. The best way to prepare is just before you go on the hike while you still have connectivity, open up the KML file and pan and zoom the trail. That data will be stored in the cache and when you actually go on the hike the app will access the information from the cache and will not need to be connected. Now that you are all experts at getting files on to your smartphone you should also think about other information. Text documents in the PDF file format can be read on any smartphone that has the Adobe Reader app installed. You can transfer files with information about your excursion and be able to access them from your phone (also without being connected. OnTheSummit has taken digital support to heart and for all of the trail guides listed on the site there are both KML and PDF files available for download. Just download the files to your computer or smartphone and you’re ready to go if you follow the instructions above. Equipped with the information and files available on this site, you have no excuse not to get out and explore the area. Just make sure that YOU CHARGE UP YOU PHONE BEFORE YOU LEAVE.